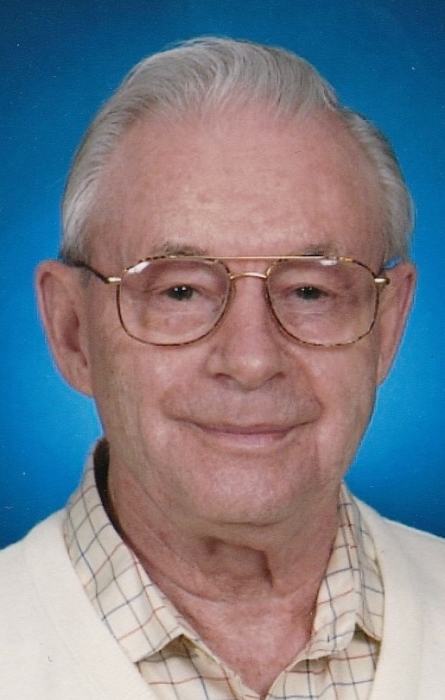 Obituary for Ivan Wallace | Esterdahl Mortuary and Crematory, Ltd.
Ivan B. Wallace, 95, of Rock Island, died Friday, November 2, 2018, at Clarissa C. Cook Hospice House, Bettendorf. Funeral services will be held at 11 a.m., Thursday, November 8, 2018, at Esterdahl Mortuary & Crematory, Ltd., Moline. Visitation will be from 4-7 p.m., Wednesday at the funeral home. Burial will be at Greenview Memorial Gardens. Memorials may be made to the Alzheimer’s Association. All need to use 60th Street for access to the funeral home. Ivan was born on January 28, 1923, in Trenton, MO, the son of Roy G. and Nora Attie (Grim) Wallace. He was a graduate of Trenton High School and later machinist apprentice school. Ivan was a U.S. Veteran serving with the Army from May 1943 until November 1945. He married Darline E. Potter on October 31, 1947, in Rock Island and they were blessed with four children before she passed on October 28, 1992. He later married Faye Harter Lind on June 17, 1995, and she preceded him in death on August 29, 2018. Ivan was a member of Salem Lutheran Church, Moline. He had previously been employed at John Deere Wagon Works, Bear Manufacturing, Rock Island, and the Rock Island Arsenal. He enjoyed golfing, fishing, reading and going on leisurely walks. Survivors include his children, John (Jan) Wallace, Silvis, Linda (David) VonDerGathen, Fuquay-Varina, NC, and Karl (Roxie) Wallace, Rock Island; daughter-in-law, Velma Wallace, Gallatin, MO; 17 grandchildren, numerous great grandchildren; brother, Junior (Scotty) Wallace, Ohatchee, AL; step children, Christine Lind, Jeffery Lind, Steve (Lisa) Lind, and Curtiss (Barb) Lind. He was preceded in death by his son, LeRoy, his wives, and his brothers, Vernon and Paul, and sister, Pauline.